Like many of the processes that drive a cell's basic functions, those enabling the splitting of a newly-replicated cell into two, shown above, happen quickly. So quickly, in fact, that scientists often have a hard time pinpointing the functions of the molecules involved. 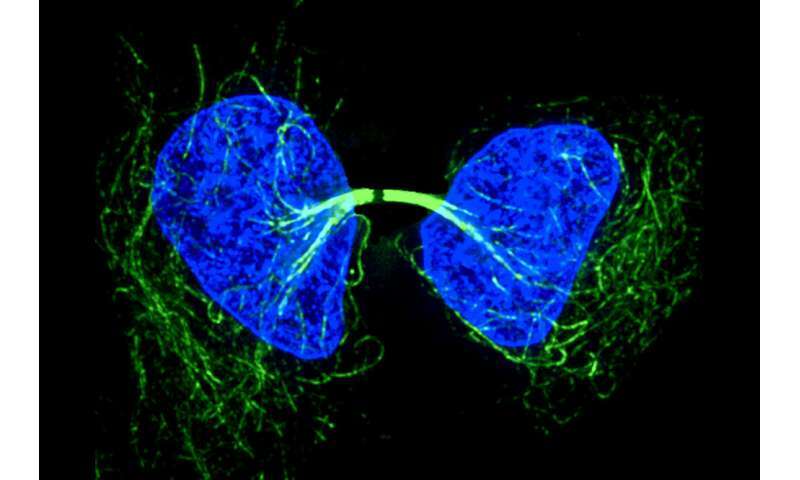 But a new chemical probe designed by Rockefeller's Pels Family Professor Tarun Kapoor will make it possible to get a close look at the function of spastin, a protein involved in cell division and thought to help regulate the structural proteins that hold cells together. The next step will be to use spastazoline to decipher spastin's role across various cell types and in different contexts. The scientists are also investigating whether spastin, which has been linked to Alzheimer's, could be targeted to treat the disease.